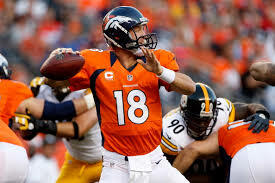 June 2, 2014 – DENVER–(BUSINESS WIRE)–Pro football star and Denver Broncos quarterback Peyton Manning today announced that he will Join the Nation, signing a new, multi-year marketing partnership with Nationwide, a leading insurance and financial services organization. Nationwide also announced an expanded relationship with the Denver Broncos Football Club. Manning, one of professional football’s most popular players and owner of multiple league records during his distinguished professional career, deepens Nationwide’s long-term presence in the sport to better engage and connect with football fans across the country. “I’m excited about my new partnership with Nationwide,” Manning said. “I view myself as more than a football player just like Nationwide is ‘More Than A Business.’ Together, we can help people successfully plan for the future and give back to the community. As part of the agreement, Manning will work with the Nationwide family of companies to support consumer and business offerings in the auto, home, life and retirement categories. Additionally, Manning will be featured in national advertising starting this fall. “We’re proud to welcome Peyton Manning and the Denver Broncos to the Nationwide family,” said Matt Jauchius, Chief Marketing Officer for Nationwide Insurance. “There are a lot of great athletes in America, but only a select few truly connect with the American public. Peyton Manning is one of these special individuals. Partnering with him will have a positive impact on our business and bring great pride to Nationwide agents, members and associates. It’s a great fit for Nationwide. Nationwide Insurance’s expanded, multi-year relationship with the Denver Broncos Football Club includes media, on-site activation, in-stadium branding and hospitality. In 2014, Nationwide will also be the presenting sponsor of the Broncos’ final regular-season home game on Sunday, Dec. 28, against the Oakland Raiders. Nationwide Mutual Insurance Company, a Fortune 100 company based in Columbus, Ohio, is one of the largest and strongest diversified insurance and financial services organizations in the U.S. and is rated A+ by both A.M. Best and Standard & Poor’s. The company provides a full range of insurance and financial services, including auto, commercial, homeowners and life insurance; public and private sector retirement plans, annuities and mutual funds; banking and mortgages; specialty health; pet, motorcycle, boat and farm insurance. For more information, visit www.nationwide.com. Nationwide, On Your Side, Join the Nation, More than a Business and the Nationwide frame mark are service marks of Nationwide Mutual Insurance Company.